They had a grand exit with a sparkler send off that lit up the sky creating a magical ambiance as the walked underneath to the awaiting Rolls Royce. 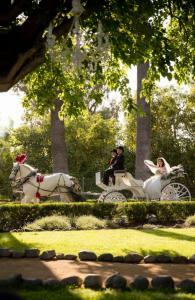 Susan Jeske and James Irvine marry in a truly beautiful fairy tale wedding rivaling that of Cinderella. 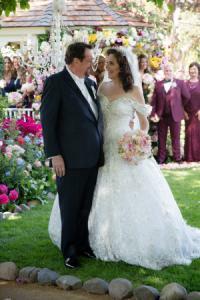 IRVINE, CALIFORNIA, UNITED STATES, July 14, 2018 /EINPresswire.com/ — Susan R. Jeske and James M. Irvine were married Saturday, June 2nd at five thirty in the afternoon at the Irvine Ranch Historic Park, part of the OC Parks, in Irvine, California. Officiating the ceremony was Eric Rees, CEO of the Jessie Reese Foundation. 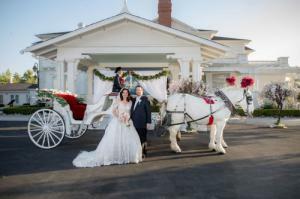 The wedding was held at the Irvine Ranch Historic Park, which is where the original Irvine family home was and is now the Katie Wheeler Library (named after James’s Aunt). James was born and raised in the home as a young boy. The gazebo and gardens were James played as a boy were transformed into a fairyland of roses for the ceremony. Pews were brought in from a 100-year-old church in honor of Susan’s Catholic upbringing. The best man was James’ son, Jeremy Irvine and the groomsmen were Bill White, James’s older brother and Susan’s brothers Tim and Mark Jeske. The Maid of Honor was Megan Augustin, Susan’s niece from Colorado. Bridesmaids were Susan’s sister Cathy Jeske, James’s niece Tracy Gaede and Jory Irvine, James’ daughter. They were dressed in a burgundy suit and full-length dresses carrying pastel pink, yellow and white rose bouquets. Bridal Attendants were Stephanie Mills, Melissa Jeske, Kimberly Lattimore, Debbie Garrett, Lea Petersen, Quinn Fry and Kelly Bennett. 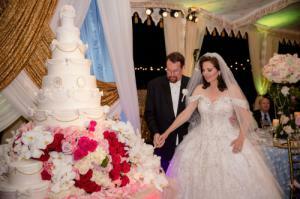 They were dressed in marine colored full-length dresses carrying pastel pink, yellow and white rose bouquets. Leading the Bridal Attendants was Stephanie Mills, Ms. America 2015 carrying a stunning custom hand-made brooch bouquet by JoAnne Maggio of Glam Bouquet. The bouquet was filled with over 1500 silver brooches, smaller crystal and rhinestones accent pieces, many that were personal gifts given to Susan from close friends, family and state, regional and national pageant titleholders. The bride was escorted down the aisle by her brother Mike Jeske. 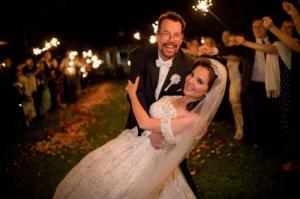 She wore a custom made Victorian wedding gown designed by world famous designer Stephen Yearick. It took two years to make of which 180 days (6 months) was used for embroidery, stitching and artwork. More than 10,000 hand-beaded additions were sewn into the couture gown including sequins, pearls and 10 types of multifaceted Austrian Crystals. Swarovski Crystals were used in the bodice and on the sleeves of the gown. Over 100 yards of eleven types of sophisticated fabrics were used and the gown weighed 35 pounds. Fifty people were involved in the creation of the gown which included Stephen Yearick, Leigh Price and Mon Amie’s owner Laurel Mungo. The bride was escorted down the aisle by her brother Mike Jeske. Susan wore the Irvine Rose Garden Tiara which was a gift from James. It was a custom made Victorian rose and garland tiara that had over 200 crystals mounted in silver and platinum representing the Rose Garden of the Irvine Family estate in which they were married. After the couple were pronounced man and wife, guests were invited to an outdoor area that was reminiscent of the Victorian era with Queen Anne couches, chairs and antique furniture. Guests enjoyed passed appetizers and a bar complete with flutes of Chandon California Blanc De Noirs and wines that contained grapes from Star Vineyard in Rutherford, Napa California which Mr. Irvine once owned an interest in. The reception was held under a magical one of a kind Victorian wedding tent that was created by Taj Mahal Tents just for the historic Irvine Wedding. It had 300 feet of hand stamped 18 Karat Gold Victorian trim, with over 150 four-inch flower appliques and 300 gold tassels hand sewn around the border breathing life and authenticity to the setting. The opulent tent was filled with delicate colors of pastel pinks, blues and gold with flower center pieces of pink and white hydrangeas, pink roses, pink peonies, pale peach stocks, pale pink spray roses, ivory roses and Queen Ann lace bursting out from a three-foot gold stand covered in white roses, green leaves and dripping of pearls on every table that was covered with a blue tablecloth and embroidered pearl lace overlay. Commemorative gifts in honor of Susan and James’s wedding were placed at each guest setting which included Modjeska Candies by Bauer’s Candy which started in 1889. James Irvine II was good friends with world renowned actress Madam Helena Modjeska who lived in Silverado Canyon here in Orange County, California. James Irvine II named his daughter Kathryn Helena Irvine after her. After the couple made their grand entrance to the sound of trumpets, they danced their first dance to the song “A Thousand Years” by Christina Perri. The dinner menu was a tribute to the success of the Irvine Ranch which was the largest agricultural enterprises in the United States and according to an article in the 1910 Los Angeles Times, “one of the greatest cultivated farms in the world.” Some of the items were selected because they were once grown or raised on the Irvine Ranch. After dinner, everyone enjoyed the handmade cake that stood 50 inches tall and weighed over 150 pounds. Lovingly wrapped in white frosting that had handmade 30 fondant bows and sugar flowers the cake was accented with Swarovski Crystals and edible 18 Karat Gold. The fifth layer of the cake had insignias of Susan and James initials representing their union in marriage. Accenting the cake was cascading fresh flowers to celebrate this beautiful day. Guests enjoyed dancing to a live ten-person orchestra to the tunes from the 1930’s to the current pop hits until Susan and James left the party. They walked under a crowd of guests lined up on each side of the walkway holding large sparklers that lit up the night – holding them up like swords – while the couple ran underneath to the awaiting 1950 White Rolls Royce Bentley to whisk them away for an evening of romance.